Over the years, the Mission: Impossible movies have translated into a variety of highly entertaining films from a diverse group of directors who put their own stamp on things. The first, second, third and fourth movies — directed by Brian De Palma, John Woo, J.J. Abrams and Brad Bird receptively — have all offered crazy, wild and wonderful scenes that often feature Tom Cruise doing something incredibly dangerous that looks far more real than they should and Christopher McQuarrie’s Rogue Nation is no exception. This one follows Ethan Hunt (Tom Cruise) as he goes rogue on a mission to shut down an international terrorist group called The Syndicate that wants to destabilize the world. This become all the more difficult when Alec Baldwin’s head of the CIA lead to the dissolution of the Impossible Mission Force. So, he recruits Benji (Simon Pegg) to come help him track down the Syndicate’s leader Solomon Lane (Sean Harris) and also find out who the mysterious Ilsa Faust (Rebecca Ferguson) is really working for. Of course, Luther (Ving Rhames) and Brandt (Jeremy Renner) also get in on the fun to help save the world. I won’t get into all the twists and turns because I can’t remember them all and even if I could, I wouldn’t want to ruin them, but this was a fun, super-taut thriller that kept my undivided attention for hits just over two hour run time. We caught it at the drive-in last weekend after watching Minions (you can read my review of that film over on my dad blog Pop Poppa). Even our 4 year old daughter seemed to enjoy the first part before she fell asleep. Now that this film has racked up five films, I’ve come to really enjoy these characters and how they interact with one another. I’ve been a big fan of Rhames since I saw him in the first film and appreciate that he’s stuck around. And, how can you not like Pegg and Renner? In a way, them all being together is kind of like the ensemble cast in the Fast & Furious movies which is a big reason they’re so popular. The downside to that is that, even though I really enjoyed Ferguson in the movie, I missed seeing Paula Patton in this movie, but maybe she’ll be back in the future! Also like the F&F movies, these are just packed with crazy action scenes. I was glad that this one wasn’t bogged down with a love story (we’ve seen enough of that in these movies) which meant that Ethan and company could focus on the main villain. This also meant that threatening a woman wasn’t a major part of the bad guy’s plan. It’s so easy to go down that route, so I appreciated Lane’s somewhat more inspired choice in kidnapee. Also, that whole thing with the underwater lockbox was super intense and it was quickly followed up by one of the franchise’s best chase scenes so kudos all around! After four years of hearing about it, I finally decided to give Doctor Who a shot and it was all thanks to a conversation held at this year’s New Year’s Eve party. Em overheard James talking to someone about Doctor Who and asked me about it yesterday. I had added it to the instant Netflix queue just in case, but never got around to starting it. Noting that we didn’t really have much to watch this weekend, Em suggested we give it a shot and we did. So much of a shot that we watched all 13 episodes of the first season in two days, starting yesterday. I think Em may have gotten more into it than I did, but unlike Weeds (a show she loves and I can hardly stand) I still had fun watching it and was often able to read a comic or two while the episodes were on. 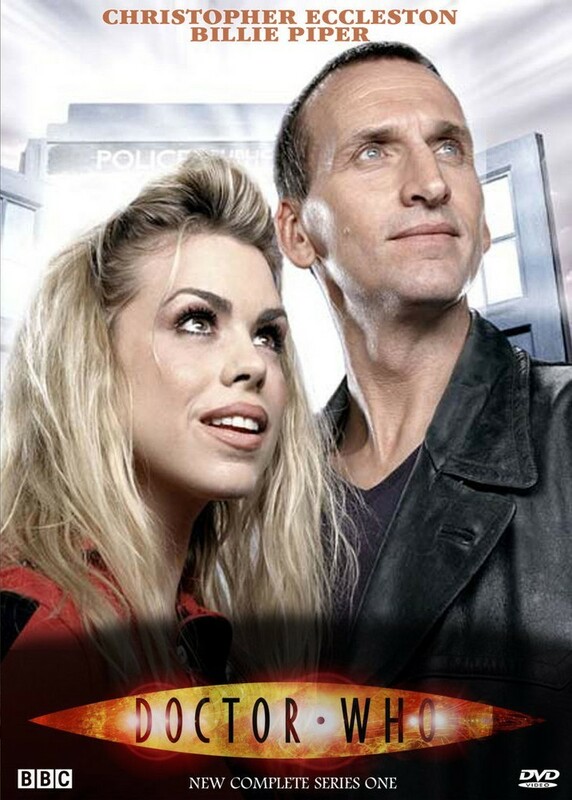 I really liked Christopher Eccleston as the The Doctor and find myself drawn to Billie Piper. I was impressed with how well put together the show is. Sure there’s some bad special effects, but the writers do a great job of getting to the heart of the matter even while throwing our heroes up against walking mannequins and Daleks. I was also surprised at how well they did at making things creepy, and I mean really creepy. The people with the gas masks from the episodes “The Empty Child” and “The Doctor Dances” gave me the chills. And the first Dalek that we see in “Dalek” even had me going for a little why, but their high, shrill voices reminded me of Timmy from South Park which is interesting because they’re basically shrunken bodies using a machine to cart them around. Go figure. I also want to mention two other things that I really liked. First up was Simon Pegg’s appearance as The Editor in “The Long Game.” I was kind of half paying attention when Em said something like “Look at this guy who’s trying to be Simon Pegg.” I looked at the screen and after a few moments realized it was, in fact, him. I remembered that someone gave someone an action figure of the character last year. Now I think I might need to track him down. I also really liked the British TV shows that made it into the future with some minor (and murderous) tweaks in the last two episodes of the season. There was Big Brother, Weakest Link and What Not To Wear (the British versions of course). Now, I don’t really know a lot about any of those shows other than the idea of an AnneDroid hosting Weakest Link is hilarious. I’ve never seen any episodes of Big Brother, but Rickey Gervais’ character does go on the show in the Extra’s Christmas Special which is fantastic and you should check it out, along with the rest of the series. Em noticed the What Not To Wear ladies and got a kick out of them. Can’t wait to burn through the next few seasons, Torchwood (maybe Sarah Jane) and maybe some of the original stuff. What’s worth watching?